At first sight, the programme of this new CD, on King's College, Cambridge's own label, is somewhat eclectic, not to say indigestible; Ola Gjeilo, David Matthews, a Beethoven piano trio, Mark Simpson, Jean-Baptise Barriere, Charlotte Bray and Respighi. The linkage between the works being cellist Guy Johnston, or more specifically Guy's cello, the Tecchler cello of the title. The CD is arranged as a metaphorical and physical journey from Cambridge to Rome, taking the cello home to the city where it was made 300 years ago. 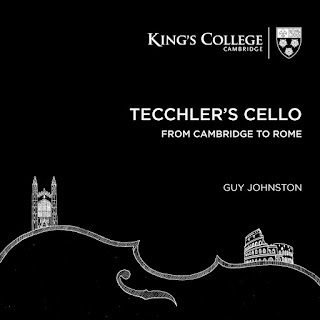 Johnston is joined in the journey by Stephen Cleobury and the Choir of King's College, Cambridge (Johnston was a chorister at King's), pianist Tom Poster and Magnus Johnston (recorded at Hatfield House where Poster and Magnus Johnston are Guy Johnston's regular collaborators in the Hatfield House Chamber Music Festival), cellist Sheku Kanneh-Mason (like Guy Johnston, Kanneh-Mason is a BBC Young Musician of the Year, and they recorded at the Royal Academy of Music) and Carlo Rizzari and the Orchestra dell'Accademia Nazionale di Santa Cecilia (recorded in Rome). There are also the three new commissions from David Matthews, Mark Simpmson and Charlotte Bray, recorded at the Wigmore Hall. 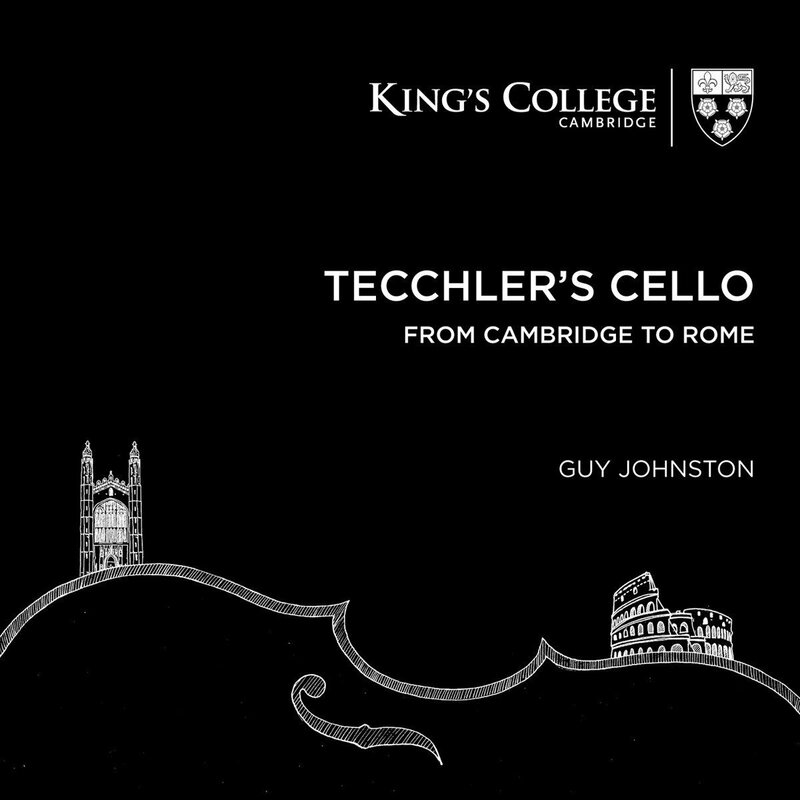 The journey celebrated the cello's 300th birthday in 2014, but also perhaps a recognition of Guy Johnston's acquisition of it in 210 and those who had helped this happen, the Stradivari Trust, Royal Society of Musicians and private contributors. The journey begins in King's College Chapel in Cambridge where Guy and his elder brother Magnus, violinist on this disc, were both choristers. Guy Johnston performs Ola Gjeilo's Serenity with Stephen Cleobury and the choir. It is a slow, richly romantic piece with the singing cello line blending with the choir to create some radiant textures. Next comes Beethoven's Piano Trio in D major, Op.70 No.1 'Ghost' with Tom Poster and Magnus Johnston, recorded in the Marble Hall of Hatfield House, where many of the festival concerts take place. The opening movement is carried off with gusto and liveliness, making very engaging listening. The atmospheric second movement, which gives the trio its name, has much fine grained singing tone from violin and cello, and moments of high drama too. Whilst the final movement is engagingly vigorous and lively. We next move to the Royal Academy of Music, where Guy Johnston and Sheku Kanneh-Mason perform the Sonata for two cellos in G major by the 18th century French composer Jean-Baptise Barriere. The opening 'Andante' is all poised elegance, whilst the middle movement 'Adagio' lets us appreciate the singing tone from the two duetting cellos, and finally there is the perky and crisply appealing 'Allegro prestissimo'. This is charming music, not deep but very elegant. From the Royal Academy of Music we move to the Wigmore Hall for the three new commissions, Guy's birthday presents for his cello. David Matthew's Ein Celloleben is very much a dramatic rhapsody, Guy Johnston's singing tone bringing out the lyricism in this complex piece. Charlotte Bray's Perseus is intriguing and full of drama, with lots of imaginative detail and a sense of going on a journey. Finally Mark Simpson's Un Regalo (A Gift) which, starting from an atmospheric opening, works up a real head of steam and becomes a virtuoso tour de force. Finally, in Rome, we hear Respighi's Adagio con variazione for cello and orchestra. Originally the slow movement of an unpublished cello concerto from 1902, Respighi returned to it in 1921. The theme is melodically attractive, and again Guy Johnston contributes much singing tone, here making this rather old-fashioned piece (the early 1920s saw RVW's Fourth Symphony and Walton's First Symphony) rather engaging. Though this is the ordering of the pieces in the CD booklet, the disc itself does not present the pieces in this order, we have slightly less of a sense of journey and perhaps more of an attempt to make a more balanced programme. This is a charming and imaginative CD, beautifully performed by all concerned, though I have to admit that it is not one which I would play repeatedly.